My name is Rebecca Roush Brown and I am the designer of ChemKnits. 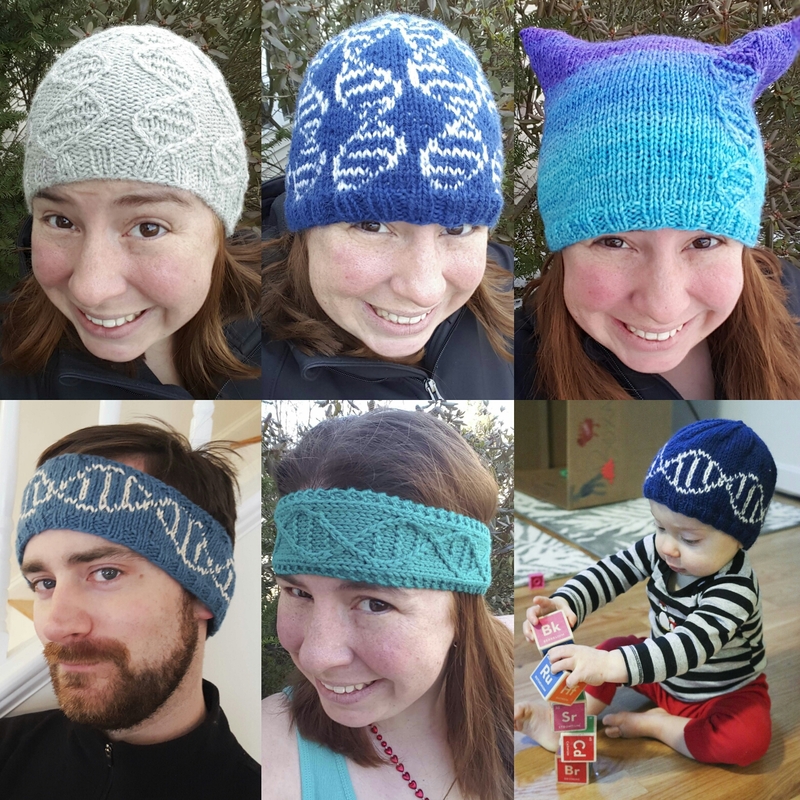 I never imagined that when I was asked to design a DNA hat in support for the March for Science (April 22, 2017 - Earth Day) that I would end up with 5 different DNA hats. Thank you all for the amazing response to the GENEie DNA Beanie collection. In this post I will summarize the 5 designs and share some other amazing free science hat knitting patterns. I designed a DNA helix cable years ago to a make a Kindle Cover for my Chemist father. This wasn't my first science design, but it was this cable that caught people's eye. This is the reason why a few different knitters separately reached out to me to create a design for the March for Science. The first hat that I knit, however, was the Colorwork version of GENEie. This is the warmest hat in the collection and may not be the most appropriate for an April march. It would be much cooler done in cotton or cotton blends. GENEie (Colorwork Version) - Modeled on my 22" head. GENEie (Cable Version) - Modeled on my 22" head. I started designing the first two GENEies before the date for the march was announced. As soon as I realized that it was going to be towards the end of April, I started thinking of hat versions that would work for warmer weather. Before I knew it the DNA helix had flipped and I was knitting GENEie - The Next Generations. (In retrospect I wish I had named these the GENEie Plasmids!) The rotated colorwork cable is slightly different than the one in the original colorwork GENEie. There are four different patterns in Next Generations: a headband and a hat version that both come in Adult L and Toddler sizes. The adult headband sample is knit in a cotton blend and that worked FANTASTIC. This is the best option if you want to knit a head accessory but are concerned about the warmth in April. GENEie - The Next Generations Hat (Toddler) - "Rowdy" is 1 year old and has an 18.5" head. On the suggestion of a dear friend, I designed the GENEie Pussyhat. All of the stores near me were out of pink yarn so I dyed my own with KoolAid and food coloring. (Dyeing yarn is a huge passion of mine. I have a YouTube channel dedicated to Dyeing Experiments!) Through this hat I wish to show my support for the March for Science and the Women's March. Finally, I'm pleased to introduce the 6th evolution of the GENEie collection... The GENEie Plasmid Headband! (Published March 9, 2017) Now there is a GENEie designed to knit flat with both line-by-line written instructions and a full chart. Of all of the GENEie designs, this is one where gauge and yarn weight truly don't matter. Cast on and knit until the headband is long enough and then sew the ends together. You could end up with a much wider headband or a really thin headband, but this is much easier to adapt than some of the other patterns. I thought the GENEies were done evolving... but then I created Spliced! Spliced is a crochet chain appliqued onto a crochet headband base. The base pairs are embroidered with a backstitch. The best party of Spliced is that you can create this design on many different backdrops; knit, crochet, or woven! Why do I march? I believe in peer review. I believe in evidence based legislation. I believe that scientific data funded by tax dollars should be available to the public. I believe in outreach programs so the general public can understand what results mean. I believe that you cannot ignore data just because it doesn't support your hypothesis. I believe that by standing up and speaking loudly that we can make a difference. This is why I march. This is why I designed the GENEies. Brain Hats - There are three versions of Brain Hat Knitting patterns on Ravelry, and it isn't immediately clear to me which design was created first... but all of the designs are darling. What these hats have in common is that a series of icords to create the crevices on the brain on top of a beanie hat. Brain Hat by Alana Noritake - This pattern is available for free Ravelry Download through the date of the March for Science (April 22, 2017). I think this pattern was created pre-2011, so this might be the original brain hat design. Brain Hat for Science by Kristen McDonnell - This pattern has a step-by-step photo tutorial for assembling the icords onto the finished hat base. Thinking Cap - Brain by Kathy Doherty - This version of the brain hat is also from 2011. Science Matters Hat - The Science Matters hat is a free knitting pattern designed specifically for the March for Science. Knit with concentric rings textured of blue and green (some colors are K around, the alternating ones are purled), this hat subtly represents our planet. This design is perfect for knitters who might be intimated by stranded colorwork or cables, all of the color changes on this hat are stripes. Heterocycle Hat - This is a fun hat with colorwork molecules (specifically heterocyclic molecules) around the brim. When I started designing my own molecule knitting charts I initially avoided molecules audreym used in this design. The pattern is available as a free Ravelry download. If you aren't comfortable with colorwork, you could always embroider a molecule with duplicate stitching to any basic knit (or crochet) hat. Trilobite - Cables and bobbles create the outline of the trilobite fossil around the brim of a beanie hat. The designer was living with a paleontologist when she realized that creating a trilobite in relief would be an awesome cable project. Chromosome Cap - This is a hat after my own heart. If you are new to cables this might be the hat for you. This hat has chromosomes going around the edge. If you are new to cables there are way fewer cable stitches than in my Cable GENEie hat. (The wrap stitch might be a little complicated but I think it is well explained.) This hat might be a better choice than the GENEie if you are attempting cables for the first time. Central Dogma Hat (DNA - RNA - Protein - This colorwork hat designed by Melini Melini is stunning, especially when constructed with two colors. I love that you can see the progression from the brim (DNA) to the crown (protein). The hat calls for sport weight yarn to accommodate the complex colorwork design. This pattern is available for free Ravelry download. DNA Hat - Do you want a DNA hat with a DNA cable running around the brim? Well then this hat is for you! The cable is worked flat, grafted together and then stitches are picked up around one edge to complete the crown of the hat. Earth in Space Hat - This is a simple crochet beanie but what makes it special is the amazing planet earth pompom on top of the hat. The pattern contains instructions so you can make your own Earth pompom. This is something that non-knitters should be able to do, too. You could add the pompom onto anything, a sewn hat, a crochet hat, or something that isn't even a hat at all. There are photos to illustrate how you should wind the colors onto the pompom maker. I cannot wait to try this pompom myself! Brain Waves Beanie (CROCHET!) - This hat isn't overtly science, but it is a very popular crochet hat that has bands of color in waves. I don't think that someone looking at it would immediately know that it was a science hat, but it is beginner friendly. Maybe you should add an Earth in Space pompom on top. This pattern is available as a free Ravelry download. Resistor Hat - This is another science knitting pattern designed specifically for the March for Science. This hat is a lovely way to show your resistance (the pun title is indented.) The designer is a microbiologist from Stanford university. This is a perfect hat for many people, but especially those who are in the physical sciences. Math Geek Hat - Pi = 3.14159265... A colorwork chart to go around the brim of the hat. DNA Scarf by June Oshiro - This isn't a hat, but given that my popularity right now is based on DNA helix cables I wanted to give a shout out to this classic DNA scarf. The DNA hat above uses the DNA chart from this pattern. Binary - This is a scarf pattern filled with 0's and 1's. While the design itself is of a scarf, I think that the 0's and 1's would look amazing on a hat for the march, too. If you are a beginner knitter (or crocheter) and want something simpler... knit any hat in a shade of green. People are planning to express their love for science through their attire in a variety of ways. Some people are tie dyeing lab coats, others are purchasing official March for Science attire. Some people will wear the pink Pussyhats that are a symbol of resistance. Many people will carry signs. I plan to wear a hat (Boston can be pretty raw in the springtime) but if it is too warm then I will come up with something else. If April 22 is going to be too warm where you live to wear hats for the March for Science, you can still create hats to show that you are a Science Fan. I guarantee that science lovers in your life will light up when they see one of these hats. GENEie - The Next Generations Hat and Headband - My head is 22" and "Rowdy's" head is 18.5"
I have no official affiliation with the March for Science. I am a Biochemistry PhD who knits and wants to share some designs that can be used to support the cause. I really enjoyed knitting the headband -- and just in time for the march tomorrow! I created another mutation when I crocheted over the knitted DNA strands with a variegated yarn. It's alive!